Air-compressor manufacturers ELGi Equipments will participate in the 10th edition of India Stonemart 2019, in Jaipur, Rajasthan. ELGi will not only display its entire range of trolley-mounted compressors, best suited for granite and marble mining applications, but also unveil a brand new trolley-mounted compressor model -- the PG75E-12.5. Also on display will be ELGi’s PG550-200, PG450-200, PG22E-7 and PG75E–12.5 models. ELGi’s portable compressors, renowned for their reliability and ruggedness, are available in single and two-stage models. These compressors find wide range of applications across the cable laying, blast hole drilling, exploratory drilling, construction, coal and marble mining, sandblasting, stone mining and crawler drilling. The portable screw air compressors feature energy saving eta-V profile air-ends, resulting in significant savings in energy costs. 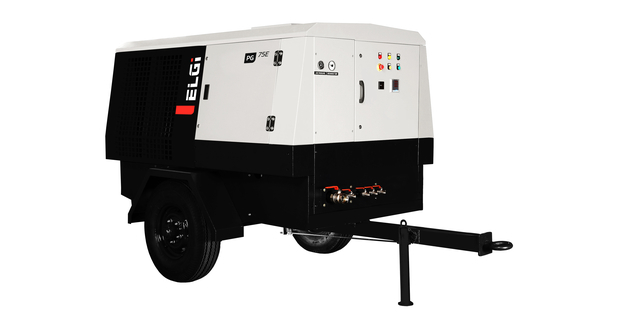 Fitted with international warranty engines, ELGi portable air compressor ensures better fuel economy and lower emissions, providing uptime and durable performance at a low cost of ownership, coupled with longer service intervals and easy maintenance. “ELGi has a legacy of providing reliable compressed air solutions to the mining industry for over four decades. Our compressors score high on reliability as they deliver the required drilling rate to the drilling units, and are very fuel-efficient too,” said Ramesh Ponnuswami, Executive Director, ELGi. “Since they have to work in dusty areas and high ambient temperatures, every compressor has been fitted with pre-cleaners and a filtration system that prevents dust from entering the compressor and the engines. With a robust industrial grade steel enclosure and powder coated canopy, our compressors offer maximum corrosion resistance and durability. ELGi’s portable compressors are manufactured locally and are therefore available on-demand and provide for ease of use via our ELGi parts and product support through tailor made warranty programmes,” he added. India Stonemart 2019 is one of the largest international events focused on the Indian stone industry. The event is expected to bring together various stakeholders from the industry including domestic and overseas producers, exporters and importers, consumers and buyers, experts, technology providers, marble and granite mining owners, processing units and traders under one umbrella.